This month has seen a number of long-form digital journalism projects either launch, or build up to going live. In the US there is Narratively for example, a multimedia platform dedicated to stories about New York which launched last week. September was also named as the aimed-for launch month for Matter, a long-form science and technology site being run by founders based in the US and UK. 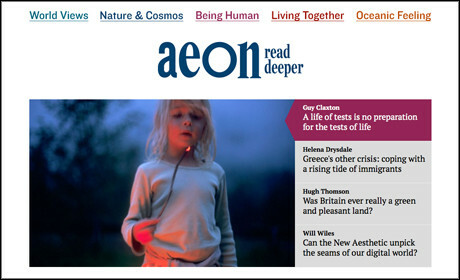 And now there is AEON, a UK-based digital magazine centred on long-form content relating to science, culture and ideas. The magazine, which will publish one piece every weekday, is due to officially launch on 1 October, although the site does already feature some content to give a taster of what is to come. The website is free to access, although in time the founders say there is "potential to extend into other platforms" at which time there may be ways to look into "building AEON into a more self-sustaining brand". While editor Brigid Hains told Journalism.co.uk that the micro-payment model in digital journalism is "a very interesting development that we're watching", for the first year at least, the focus will be on "investing in AEON as a digital magazine". "Our aim is really to build interest and readership and the best way to do that is to be open access and to get that material out. Every story that we have we want to get out to the people who are most interested in it," she added. "And then over time we imagine ourselves then developing further platforms and we're thinking about the potential for events and so on." Looking at the presentation of the digital magazine as it prepares for launch, Hains said there was always "a vision really of having an online presence which is very interactive, which is closer to a conversation". She added that it felt like the right time for "some kind of platform that would be a way for people to reconsider values and delve behind the news, to have the kinds of conversations about ethos and world views that we feel are bubbling away in the culture". "So we've been thinking for a long time what would be the right way to do that, to create a space where people could have those conversations and AEON as a digital magazine is really the first manifestation of that ambition, I would say. "We see it as the first way we want to create that kind of cultural space." The aim is to create an "immersive" experience for users, supported by a responsive site with a "clean" design. "I think, as so many people are now saying, there's a shift. The tide is turning where people are saying let's build a platform that is uncluttered, that's clean, that people can just enjoy and immerse and feel themselves to be part of something that they ... can thoroughly interact with and not be continually distracted." Designer Jeremy Leslie of MagCulture, added that they "didn't want it to come across as just another website with banners and things shouting at you and 'read this' and 'look at this' and 'look at this'". "We wanted it to be a calmer experience because that reflects the content itself, the nature of the content." He added that elements of the design, such as the "line length, size of font, and the line spacing and use of dropped capitals and pull quotes" are on appearance "very print-orientated". "But we're not using them because we're trying to be print, we're using them because they're efficient ways of helping people navigate through long bands of text." So how long exactly is that text? Discussing what their criteria is for the content which will be published by the magazine, Hains said this is "a continually evolving question". "We've always talked about ourselves as doing in-depth pieces, and we think well, what does that mean? Is that a word count question, or is it a tonal question? I think it's both. "I think that it is very difficult to do a piece that does go deep and that does look behind the news, that does delve, without giving a writer 1,200 words or 1,500 words at a minimum." She added that this can then range up to around 6,000 or 7,000 words for "long, analytical memoir or narrative pieces". "At this point I don't think we want to put any artificial cap on how long our pieces might go. We're in a phase now of experiment to see will people love those long pieces, will they spend the time that it takes to sit with them?" And when it comes to the topic direction of the magazine, Hains said she sees a "lot of space in the market". "I agree with the Matter people [Bobbie Johnson and Jim Giles] that there is a space for that kind of 'implications of science' work. Telling the stories of science, going into depth, the sort of thing that you might see occasionally in the New York Times ... So I do think there's a lot of space in the market." While the focus starts with "getting terrific writing" and the hiring of "eloquent, serious writers", Hains also said multimedia opportunities will also be considered. "I think it would be really such a shame to turn your back on the opportunities that the digital platform offers. "One of the distinct things about us, as it is about Matter, or Narratively, or Atavist or any of these projects, is that we're all born digital. "So we're all coming into the cultural space as a digital entity, we're not just trying to adapt a print platform and add on bolt-on bits and pieces. So we definitely do want to develop the multimedia dimension". She added that AEON's "gentle foray into that" comes in the form of audio interviews with the authors, which will appear at the top of some pieces, or even spoken essays to offer readers a different way to consume the content. "We think that might be a really lovely thing to do, because just as you might read it later ... you might be just as happy to listen to that and we think why not. "We're certainly not just fixated on just the text although as you can see our website is very much built around that immersive text experience. So yes, we are interested in the multimedia, we will be doing a little bit of experiment with embedding video and so on. And I think there's a lot more than we could be doing there."